Steven (Chicagoland, United States) on 26 January 2010 in Landscape & Rural and Portfolio. A portion of a quadrapede's segmented body that appeared on the shores of Lake Michigan. A distant relative of the millipede, the quadrapede has up to four times as many legs as a millipede. This allows it to sneak up on the most unsuspecting of victims without any audible noise revealing its approach. All kidding aside, this was another "alien" find on the lakefront of the Illinois Beach State Park. But what I wanted to capture was the scope of the formations up and down the shoreline. This area pictured is typically flat as a pancake and to see these formations is just a weird sighting. Photo captured on January 10, 2010. Very interesting.. thanks for sharing.. This is so interesting to me. I am glad you're posting this series. this looks really alien :) very interesting. fantastic clarity in this image ! Great POV ! Nice image great details and this a very intersting place. An alien invasion to be sure. 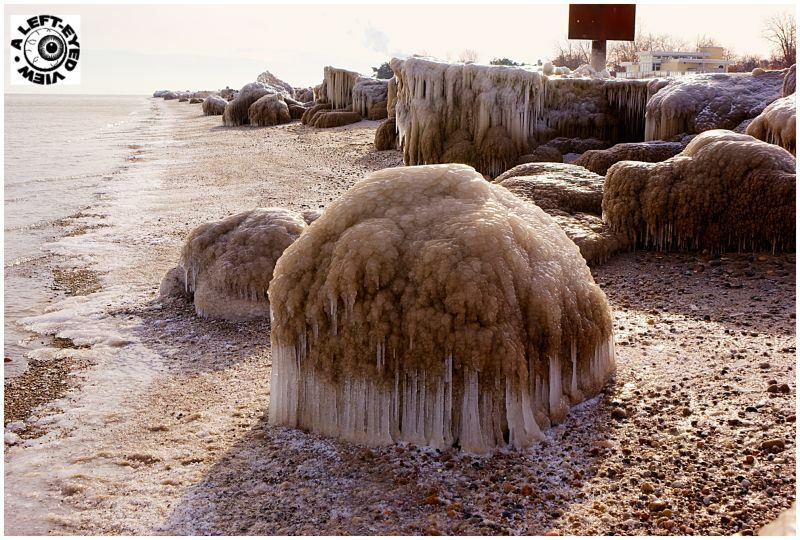 It's amazing what some very cold weather can do with water and sand. I like this nice long view of the shoreline. @Steve Rice: Every time I mention "alien" I think back to your "frozen captures" near a river that you shared with us about two weeks ago (or so). Really incredible sight ! Nicely captured ! They really do look like crystal formations. On the other hand somewhat like "the blob" you know they just might be gobbling people up and.. growing! The one in foreground is like a large fungus determined to hang on.